We’d love your help. Let us know what’s wrong with this preview of Sight Unseen by James Swallow. In the wake of political upheaval across the United Federation of Planets, Admiral William Riker and the crew of the U.S.S. 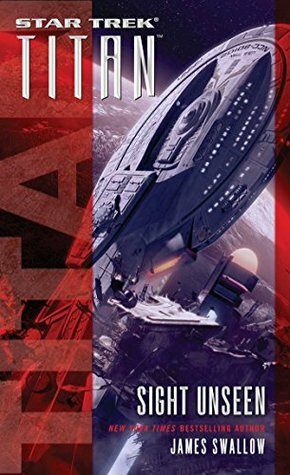 Titan find themselves in uncertain waters as roles aboard the ship change to reflect a new mandate and a new mis An original spin-off novel set in the popular Star Trek: The Next Generation universe from New York Times bestselling author James Swallow! To ask other readers questions about Sight Unseen, please sign up. Truly great Star Trek novel! Admiral William T. Riker has been an “admiral without portfolio” for some months, and now that the events of “The Fall” are behind, finally Starfleet is defining a concrete agenda for him. Riker is now Sector Commander of the Alpha Quadrant Frontier, which is certainly a big promotion giving him a lot of power. Due his new position of sector commander and since Riker never has been confortable in a static desk, instead of other sector comman Truly great Star Trek novel! Due his new position of sector commander and since Riker never has been confortable in a static desk, instead of other sector commanders having their bases-of-operations in space stations and/or planets’ surfaces, he will use the USS Titan as his mobile base-of-operations. However, having his flag on the ship doesn’t mean that he will stay as commanding officer of the USS Titan. Christine Vale finally is promoted to Captain and giving the Titan as her own command. Starfleet Command is assigning two officers to the USS Titan, Lt. Ethan Kyzak (he is from the Skagaran colony at the Delphic Expanse commonly known as “North Star”) and Cmdr. Dalit Sarai (she is a female Efrosian and former Starfleet Intelligence officer who “fell-from-grace” due her position in favor of Ishan Anjar during the polemic events of “The Fall”). Lt. Kyzak will be a relief Helm Officer and Cmdr. Sarai is surprising assigned to be the new First Officer aboard Titan. The USS Titan, a Luna-class starship, is easily the most diverse vessel in the Starfleet in the topic of sentient species from the United Federation of Planets aboard of it, and due that, Admiral Riker is convinced that Titan will be a perfect example of what the Federation can accomplish working together. Titan’s first mission is to contact the Dinac species, that they are the sentient dominant species of the Casroc planet, and that that life forms is beginning to test their brand-new Warp technology, also asking for a membership in the Federation, and due that the USS Whitetree, a Starfleet Academy school vessel, is having for several months, to establish socio-political relationships with the Dinac and giving assistance to the Dinac space program. However, while the USS Titan is still in transit going to the Dinac space borders, the crew is informed that all communication was lost to both, the Dinac prototype Warp vessel, and the USS Whitetree who was escorting it. Insidious, powerful and scary enemies from Riker’s past will rise again, not only threatening the Dinac species but also setting a new menace to the entire Federation! Captain Christine Vale is getting into this distinguished “club” of the Star Trek Captains, where they are the ones to make a difference as long they are in the “big chair”. She was “hanging around” for several years on the “Relaunch” (Expanded Universe) novels, appearing in various book series becoming one of the most popular expanded universe characters in Star Trek. She served onboard of various starships, including the USS Enterprise-E as Security Chief, and Command isn’t strange to Chris, since she was First Officer of the USS Titan for six years and even she got recently a temporary command of the USS Lionheart (a Nova-class starship serving as medical vessel), during the events of “The Fall”. However, Christine Vale will have a baptism of fire on her first mission as captain of Titan not only having to deal with Admiral Riker who is having troubles to distinguish the difference between having the USS Titan as his flag ship and being actually the captain of the vessel, testing to the maximum the friendship and loyalty that they have shared so far, along with having a new First Officer that she isn’t familiar with and Vale and Sarai are barely beginning the process of creating their own dynamics about supporting each other’s decisions, and moreover, realizing that now the hard choices are her call, she is the captain and she will have to make the hard choices about life and death, not once, but every single day. Es hat lange gedauert, bis wieder ein Roman aus der Reihe "Titan" erschien, obwohl die TITAN immer wieder Auftritte in den Star Trek-Schlüssel-Serien wie "Typhon Pact" und "The Fall" hatte. William Riker wurde im Rahmen der Handlung in der Staffel "The Fall" zum Admiral befördert, ohne jedoch sein Kommando an der Titan abzugeben. In diesem Roman bekommt er neue Befehle: Er muss das Kommando abgeben an seinen bisherigen XO Christine Vale wird Captain und sie bekommt durch Commander Sarai einen um Es hat lange gedauert, bis wieder ein Roman aus der Reihe "Titan" erschien, obwohl die TITAN immer wieder Auftritte in den Star Trek-Schlüssel-Serien wie "Typhon Pact" und "The Fall" hatte. William Riker wurde im Rahmen der Handlung in der Staffel "The Fall" zum Admiral befördert, ohne jedoch sein Kommando an der Titan abzugeben. In diesem Roman bekommt er neue Befehle: Er muss das Kommando abgeben an seinen bisherigen XO Christine Vale wird Captain und sie bekommt durch Commander Sarai einen umstrittenen neuen XO, der bei der Verschwörung gegen die Förderation durch den Förderationspräsidenten Ishan Anjar auf dessen Seite gestanden hat, während die Admirale Akaar und Riker gegen diese Verschwörung angekämpft; und gewonnen haben. Die TITAN wird das Flaggschiff von Admiral Riker und sie wird an den Rand des Förderationsraumes geschickt, weil sich dort was zusammenbraut. Eine Spezies aus einem fremden Universum gelingt durch die Schaffung eines Raumrisses den Übergang in unser Universum, dabei entführen sie ein Förderationsraumschiff und ein Schiff einer aufstrebenden neuen Zivilisation, die sich um die Aufnahme in die Förderation bemüht. A real page-turner that features everything that I love about Star Trek novels. There are a lot of stories out there in the wider Trek universe, but it is books like these that keep me buying Trek lit. I realize this has become a familiar refrain of late, but in my opinion this is the best of the Star Trek novels released so far this year. They just keep getting better! If you are at all a fan of Titan or are a new fan looking for a good place to pick up the story, Sight Unseen should not be miss A real page-turner that features everything that I love about Star Trek novels. There are a lot of stories out there in the wider Trek universe, but it is books like these that keep me buying Trek lit. I realize this has become a familiar refrain of late, but in my opinion this is the best of the Star Trek novels released so far this year. They just keep getting better! If you are at all a fan of Titan or are a new fan looking for a good place to pick up the story, Sight Unseen should not be missed. Ushering in a new and promising chapter for Titan, this story has everything you could want in a Trek novel. I finally got around to reading this book this past week and loved it! Nice pace and character interactions! Vale getting accommodated to the captain's chair and the tough calls that come with it has really expanded her character. And how cool that she stood up to Riker, who also is adjusting to the rank of Admiral. I hope James Swallow gives us a new Titan tale that picks up from where things left off with Sarai. Solid & exciting storytelling, that sends the crew of the USS Titan off into space with a new mission and a new sense of purpose. It's a great jumping on point for newcomers to Admiral Riker's world. It's also a thrilling adventure in its own right, but with the right amount of "Star Trek" optimism permeating the story. Very satisfying. Excellent! Schisms was one of my favorite episodes of TNG, so I was glad to see that episode's mystery finally revealed. I always wondered who they were & what exactly it was they were doing & i think James Swallow did a fine job of showing us that. Highly recommend. 1) Ra-Havreii. Never liked that character. Still don't. Probably never will. 2) The fact that Riker is an Admiral. I just hate it. 4 Stars. Another really good Titan book. Have really enjoyed the Titan Series & hope more get written, As of right now (5/8/18) there is only one more book in the series. There is some sort of negotiation going on between Pocket Books, which publishes the Star Trek books, & the owners of the Star Trek world. I say, figure it out & Publish more books, & split the millions of dollars. Stop holding the fans hostage. It's a decent "Star Trek: Titan" novel, but with Riker's and Vale's promotions, neither one of them know how to handle their new situations, and neither does the reader as characters you know and love are placed in situations both in and out of their character. Throw in several new characters to boot, and all of this hampers what could have been a truly great story. The good news is Riker, Troi and their motley crew of aliens are back. The bad news is the plot's rather weak with a half-hearted return of the villains from the TNG alien abduction episode "Schisms." They're made out to be a dire threat but basically come off as a pale imitation of Species 8472. If it's a Star Trek book...pretty much I will like it. Kudos to all those who keep the series alive in the books. A nice followup to a Next Generation episode. Hard to put down. James Swallow's "Sight Unseen" is something a little different even by the Titan novel standards - a sequel of sorts to the TNG episode "Schisms" albeit in not as disturbing a fashion as that episode was. The story involves the Titan finally getting out of Spacedock & heading out onto a different type of mission than they originally intended as more of a patrolling job through a sector of space that Admiral Riker has been assigned to command. He then subsequently promotes Vale to Captain of James Swallow's "Sight Unseen" is something a little different even by the Titan novel standards - a sequel of sorts to the TNG episode "Schisms" albeit in not as disturbing a fashion as that episode was. The story involves the Titan finally getting out of Spacedock & heading out onto a different type of mission than they originally intended as more of a patrolling job through a sector of space that Admiral Riker has been assigned to command. He then subsequently promotes Vale to Captain of the ship & we the reader get 2 new characters in Commander Sarai & Lieutenant Kyzak both of whom add to the diversity of this ship's crew. The first mission under this new assignment is to work with the Dinac who've been assisted w/ their foray into space by the USS Whitetree. When both come up missing an old foe in a race now known as the Solonae are discovered to be behind the disappearances causing nightmares for Riker & Rager who experienced the abductions the first time & major tensions between Riker & Vale. Once again loose ends from the Star Trek Next Generation TV show are tied, and once again I loved it! This bit of closure comes from an episode that never got good reviews (I always liked it). Crewmen (including Commander Riker, Lieutenant Worf, Lieutenant Commander Geordi LaForge and Ensign Sariel Rager) experienced sleep disruption and loss of a sense of time. It turned out that an unknown alien species found a way to open a portal from their reality and take people and objects into theirs. Th Once again loose ends from the Star Trek Next Generation TV show are tied, and once again I loved it! It's been years, but Riker and Rager still bear the psychological scars of being abducted and experimented on. Admiral Riker is assigned as sector commander for a remote portion of the Alpha Quadrant and he's keeping Titan as his mobile office, under the command of newly minted Captain Christine Vale. Lieutenant Commander Rager is also newly promoted, just in time for the Titan to discover a new incursion by this same alien race (called the Solanae by Starfleet). This time, they're using what they learned from countless previous experiments to launch a full scale attack. I enjoyed seeing new characters join the crew (Commander Dalit Sarai, last seen in Peaceable Kingdoms and Lieutenant Ethan Kyzak, a Skagaran from a colony whose society is based on Earth's Old West), but I hated that not one, but two longstanding regular characters died (won't say who, but they've been with the crew from Day One and one hurt worse than the other). Enjoyable spin off with major characters Riker and Troy. Titan is a ship full of a variety of species living together and solving the numerous problems thrown at them. This particular adventure features creatures from a previous Next Gen that are insidious and creative in their attack style...the crew was put to the test in this one. I recommend it. This Titan story is interesting and entertaining in spots and it was so great to see Riker in action as a first officer of sorts, even for a little time. The main plot of a threat from Enterprise's history coming back to torment Riker was a good one. There is a good bad guy group and a death defying trip to another universe. It could have used some more personal interest story. It could have used a main villain. The characters are so rich in places and kind of mixed and confused in others. One of the problems is that there are so many odd names used and different creatures on board that it is difficult to track them all or even pronounce some of their names. The ones you do know, Riker, Tuvok, etc do not get used nearly enough. This review has been hidden because it contains spoilers. To view it, click here. I missed this when it first came out and are late to the party. This book fits into the extended universe, and while doesn't require knowledge from previous books in this series it would be helpful. It borrows from events in 'The Fall' series as well as previous Titan books, and an original TNG Episode "Schisms"
I've always enjoyed these post DS9/Voyager home extensions so this was no different for me. It builds up that ache in my heart for wishing there was more from the idiots at Paramount from I missed this when it first came out and are late to the party. I've always enjoyed these post DS9/Voyager home extensions so this was no different for me. It builds up that ache in my heart for wishing there was more from the idiots at Paramount from this world and wondering when the hell we're going to get Discovery. It would be nice to have a next-next generation though, I'd like to see the future through their eyes too, with some new social commentary to build on. A thoroughly enjoyable Star Trek book that references a Star Trek: The Next Generation episode but also takes full advantage of the unique characters of the USS Titan. This makes me wish that the new Star Trek series being developed was Star Trek Titan. Not only does this novel stem from a TNG episode, it also lives in the universe created by the Star Trek novels post-Deep Space Nine. This is a different Federation than that originally conceived by Gene Rodenberry, but the universe is slowing re A thoroughly enjoyable Star Trek book that references a Star Trek: The Next Generation episode but also takes full advantage of the unique characters of the USS Titan. This makes me wish that the new Star Trek series being developed was Star Trek Titan. I've not read all of the Captain (now Admiral) Riker books on the USS Titan, but I've read a number, and intersected with them in the arc of stories with Bashir's going rogue, so I wasn't out of my depth in following this story. With all the eons of Star Trek - TV, film, novels - it's mind boggling to keep track of everything and everyone in the Trek Universe. Fortunately, Swallow and his Trek-scribe colleagues do that - no doubt with assistance - so if the story moves, and they don't mess up, you get a good story out of it. Following the events around Bacco's assassination, it's time for Titan to return to its mission...but a modified version. Revisiting an incident during the days of the Enterprise-D, Titan is forced to investigate a missing starship of Academy cadets. Titan is adjusting to its new command structure and trying to get back on course. Good novel. Tight pace and plotting, and the characters from ST:TNG & Voyager seem true to themselves. I would have liked more moments of self-reflection and character insight/internal thoughts (such as when Tuvok reflected on family v. duty) but I guess that's not the norm in sci-fi. Still, I was satisfied with the book at novel's end and wouldn't mind reading more from this author, especially set in a world I like and with which I am familiar (e.g., the Star Trek world). A return for Riker and a few other members of the TITAN crew who served aboard ENTERPRISE to the pocket dimension Solinae, and a splinter group of that race that want noting to do any longer with abducting and experimenting on beings from the dimension in which the Federation exists. A good read, well written and well researched on the authors part, linking some of the new adventures of the former First Officer of the Enterprise to his current mission, on the TITAN. Good and fast paced. Everything except for the seeming error regarding frequency in keV. killo electron volts would be a measure of energy and not frequency. Minor detailed. Liked the the book though. Give us more of the Next Generation work. The book did an excellent job of expanding a species seen only briefly in 1 episode of The Next Generation. An OK entry, but nothing fantastic. An excellent novel and story. A new ground for an even more exciting Star Trek multiverse. James Swallow is a New York Times, Sunday Times and Amazon bestselling author and scriptwriter, a BAFTA nominee, a former journalist and the award-winning writer of over fifty books, along with scripts for video games, radio and television. His writing includes the Marc Dane action thriller series, the Sundowners steampunk Westerns and fiction from the worlds of Star Trek, Warhammer 40000, Doctor James Swallow is a New York Times, Sunday Times and Amazon bestselling author and scriptwriter, a BAFTA nominee, a former journalist and the award-winning writer of over fifty books, along with scripts for video games, radio and television. His writing includes the Marc Dane action thriller series, the Sundowners steampunk Westerns and fiction from the worlds of Star Trek, Warhammer 40000, Doctor Who, 24, Deus Ex, Stargate, 2000AD and more. SHADOW, the next Marc Dane novel, will be released in May 2019, and the second book in the series - EXILE - will be published in the USA by Tor/Forge. You can also follow James on Twitter at @jmswallow for more updates!